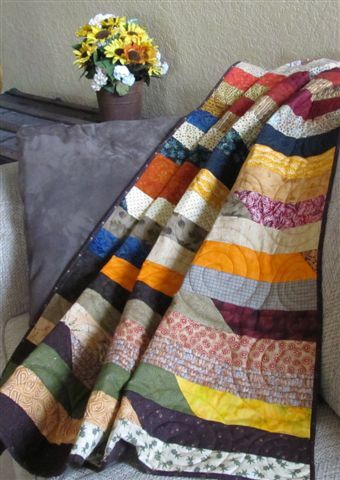 Have You Made a Quilted Symphony Yet? 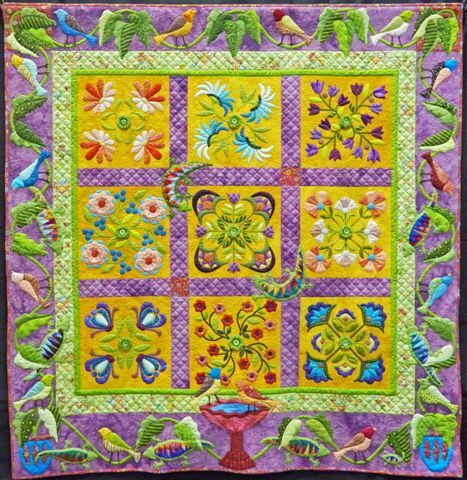 Have you seen the book titled quilted symphony by ﻿Gloria Loughman? My collection of books is more extensive than I would ever admit but this book really inspired me! So much that I convinced a friend http://feltingfibersandfabrics.blogspot.com/ who has made a few of these to guide me through the process of making one. We spent a FUN day together working on our creations. That was two weeks ago and I am now stuck! If you have this book you may recognize my project as one in the book, except for a few modifications. I am after all, one of those people that can NEVER make anything as instructed! Anyway... The top section is giving me problems. My dilemma is with color. This is not an area that usually stumps me to the degree this project has. The blue sky seems to be the perfect piece but in trying several building colors, light, dark and medium shades, nothing seems to be just right. I have considered changing my sky fabric but no other color allows my YELLOW SUN to pop like this blue. Of course, at this point it may not be relevant because my sun is MIA. I think the cat ran off with it. 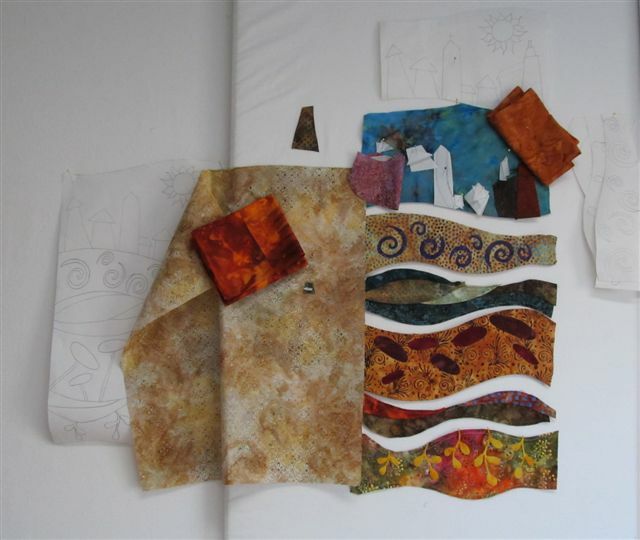 A quilt show always leaves one inspired to make a quilt. So today was spent in my sewing studio determined to make (or complete) something. You've heard that saying, "the best laid plans of mice and men often go astray", that pretty much sums up my day. Nothing got completed, except a couple loads of laundry. I floundered around with a project on the design wall and finally came to the conclusion that I'm just as STUCK with it this week as I was last week. 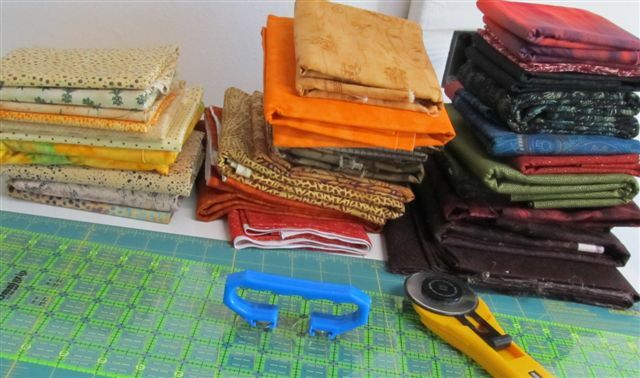 Then there's the FOUR projects on the sewing table, all folded and stacked into neat piles, just waiting for me to START them. But... the brain just wasn't connecting with the inspiration. Oh well, there's always tomorrow. Well, here it is!﻿ A finished Jelly Roll quilt. A week... or... so... ago I posted (A Jelly Roll Race!) 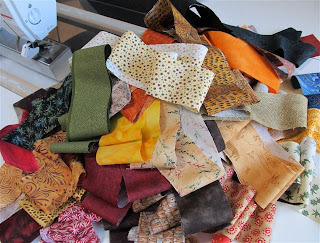 about a pile of scrap strips that were to be used like a Jelly Roll. The pile wasn't so pretty but the quilt turned out lookin' pretty good! This project was spurred by the fact that I was to officiate a Jelly Roll Race. The race was a BLAST and I hope I get to officiate more races in the future. 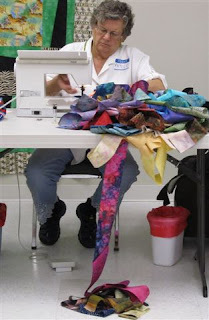 Phyllis didn't have a Jelly Roll but she had something close... The remnants of a long ago purchased kit that contained many strips 3 inches wide and maybe 18 inches long. So with Jelly Rolls (and one pretend Jelly Roll) readied the race was on. It took us about 3 hours, including the pre-race prep work. The fastest sewer took her last stitch at the 50 minute mark. Diane's Jelly Roll didn't exactly cooperate during the race prep but once it was prepped she gained total control of it and left the other racers behind in the lint balls (if you've never seen a lint ball come to my house, I'm infested with them!). 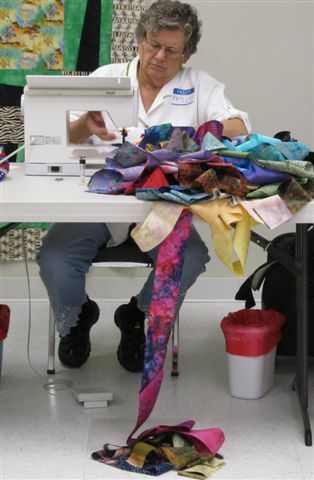 Diane was awarded with a Winners Award Certifcate that she can frame and proudly display in her sewing space and a $35 gift card for 35th Ave Sew & Vac. I think the gift card was spent (on a Jelly Roll) before she left the building. Way to go Diane! The last racer came across the finish line with a nicely done top. Isabelle is a veteran racer, however in this race experience did not equal FAST. 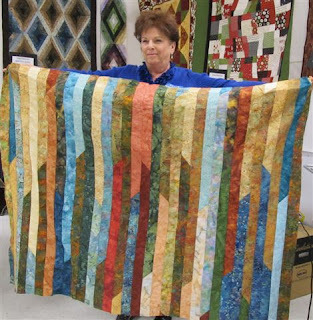 Isabelle also went home with something to display on her sewing space wall, a Participants Award, AND a Jelly Roll of her choice so she can hone her Jelly Roll Race skills. I think we'll see Isabelle at future Jelly Roll Races and hope to see her in the Winners Circle next time. What better way to start the New Year than to do a FUN project?! This Saturday, January 7th, I'll be hosting a Jelly Roll Race. 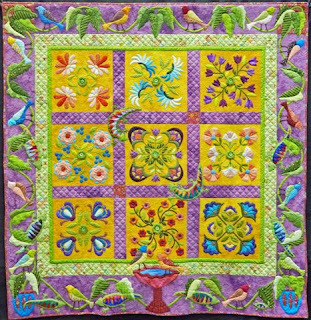 ﻿ A few months ago I participated in one of these races and it was a blast, so I thought I'd share the FUN with all my quilting friends. :o) Since the race is only a few days away I need to get ready. Problem is I don't have a Jelly Roll so I went through my stash and came up with some fabrics to make my own. As you can see the fabrics are not from a line like a real Jelly Roll (my stash isn't that extensive!) so my Jelly Roll will be... scrappy. Strips are cut (that took longer than I thought it would). 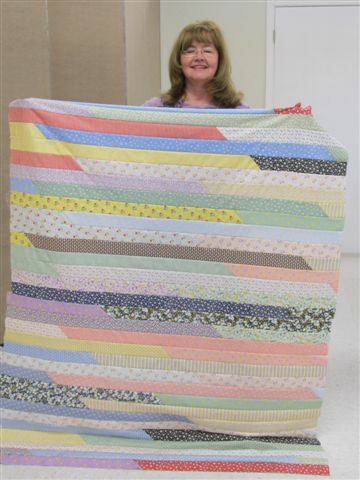 Somehow scrappy doesn't look as pretty as a neatly rolled Jelly Roll the quilt shops carry. Hopefully the quilt turns out prettier than this mess. I'll post a picture for you when this all becomes a PRETTY quilt. Oh... If you want to become a participant in the Jelly Roll race you can register by coming by the shop or giving them a call. The gals over there are really friendly and they'll get you all set up. It will only cost you 3 hours of time and 15 bucks (plus a Jelly Roll). And the best part is the winner gets a PRIZE!